Please note that the content of this book primarily consists of articles available from Wikipedia or other free sources online. 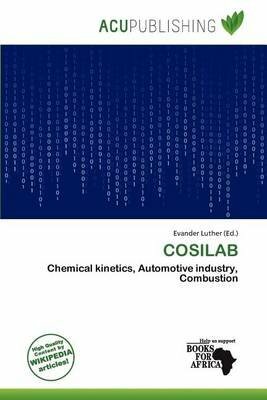 COSILAB is a software tool for solving complex chemical kinetics problems. It is used worldwide in research and industry, in particular in automotive, combustion, and chemical processing applications. Problems to be solved by COSILAB may involve thousands of reactions amongst hundreds of species for practically any mixture composition, pressure and temperature. Its computational capabilities allow for a complex chemical reaction to be studied in detail, including intermediate compounds, trace compounds and pollutants.